Wubbzy, An Example Dairies Care! Even though there are many animals on our dairy, my little sisters still manage to make them all pets. Wow Wow Wubbzy, Wubbzy Wubbzy Wow Wow (yes, that’s his full name!) is probably one of the smallest little calves on the dairy with the longest name. 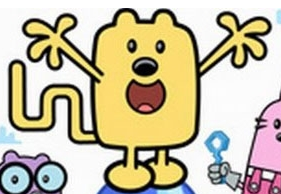 I’ll first explain how Wubbzy got his ridiculously long name. If you watch Nickelodeon Jr., there is a cartoon called Wow Wow Wubbzy. There is a whole song about Wubbzy, and my sisters seem to think calf Wubbzy and cartoon Wubbzy look the same… I still don’t see it. As I mentioned in my previous post, baby calves have very weak immune systems when they are born, but gradually get stronger with age. Unfortunately Wubbzy got very sick as a small calf, and nearly died. My sister was able to give him an enormous amount of intense care and he miraculously managed to pull out of his illness. Wubbzy somehow worked his way into celebrity status, all the girls on our dairy love him!! Because he was so sick for his first few weeks of life, Wubbzy’s growth was severely stunted. Wubbzy was easily one of the smallest in his age group! Of course it didn’t help that he was a Jersey calf. (Jerseys are a breed of dairy cows that are typically smaller than Holstein cows, another dairy breed). Besides being so small, Wubbzy is quite healthy now and growing faster than ever. Wubbzy also has been recruited by my sister to go to the local county fair! I managed to capture Wubbzy on my Iphone the other day. Wubbzy is the little brown calf who is devouring his lunch. He has a pretty big appetite..
As the creator of Wow! Wow! Wubbzy!, I have to say that your calve’s name is awesome! He sounds like a scrappy fella. I’d like to meet the little guy sometime! Wow, I never thought the creator of Wow Wow Wubbzy would be commenting on my blog! Thanks for commenting! I have to tell you my little sisters are big fans of your show, thats how he got named. Be looking for a new posting i’m writting about Wubby going to the local county fair!